Gnarled human torsos with animal heads emphasise the link between man and beast in artist Dina Chhan’s latest exhibition, opening tonight at Meta House. 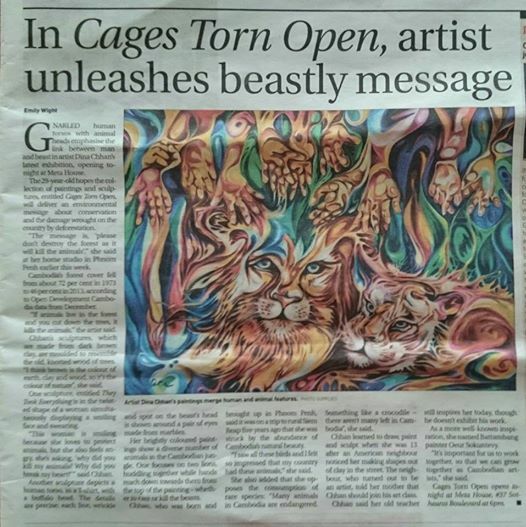 The 29-year-old hopes the collection of paintings and sculptures, titled Cages Torn Open, will deliver an environmental message about conservation and the damage wrought on the country by deforestation. “The message is, ‘please don’t destroy the forest as it will kill the animals’,” she said at her home studio in Phnom Penh earlier this week. Cambodia’s forest cover fell from about 72 per cent in 1973 to 46 per cent in 2013, according to Open Development Cambodia data from December. “If animals live in the forest and you cut down the trees, it kills the animals,” the artist said. Chhan’s sculptures, which are made from dark brown clay, are moulded to resemble the old, knotted wood of trees. “I think brown is the colour of earth, clay and wood, so it’s the colour of nature”, she said. One sculpture, titled They Took Everything is in the twisted shape of a woman simultaneously displaying a smiling face and swearing. “This woman is smiling because she loves to protect animals, but she also feels angry, she’s asking, ‘why did you kill my animals? Why did you break my heart?’” said Chhan. Another sculpture depicts a human torso, in a T-shirt, with a buffalo head. The details are precise: each line, wrinkle and spot on the beast’s head is shown around a pair of eyes made from marbles. 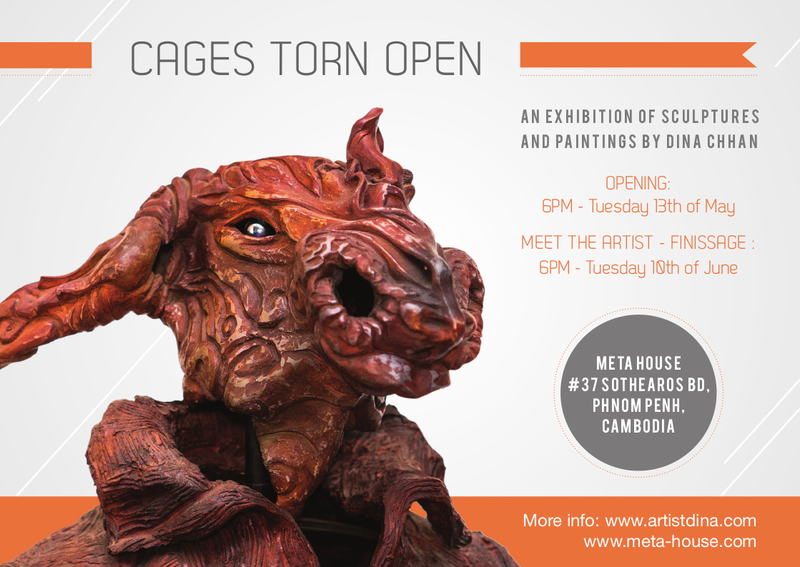 Her brightly coloured paintings show a diverse number of animals in the Cambodian jungle. One focuses on two lions, huddling together while hands reach down towards them from the top of the painting – whether to care or kill the beasts. Chhan, who was born and brought up in Phnom Penh, said it was on a trip to rural Siem Reap five years ago that she was struck by the abundance of Cambodia’s natural beauty. “I saw all these birds and I felt so impressed that my country had these animals,” she said. She also added that she opposes the consumption of rare species: “Many animals in Cambodia are endangered. Something like a crocodile – there aren’t many left in Cambodia”, she said. Chhan learned to draw, paint and sculpt when she was 13 after an American neighbour noticed her making shapes out of clay in the street. The neighbour, who turned out to be an artist, told her mother that Chhan should join his art class. Chhan said her old teacher still inspires her today, though he doesn’t exhibit his work. As a more well-known inspiration, she named Battambang painter Oeur Sokuntevy. “It’s important for us to work together, so that we can grow together as Cambodian artists,” she said. 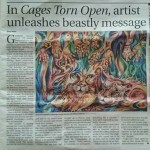 Cages Torn Open opens tonight at Meta House, #37 Sothearos Boulevard at 6pm. I have a new exhibition at FCC Cambodia. Please come and support Cambodian art. This exhibition of mixed medias, where photography meets paint. A project about public spaces have been “homestructed” and ended up turning into a home, into a vital community. Big format exhibition by Dina Chhan. 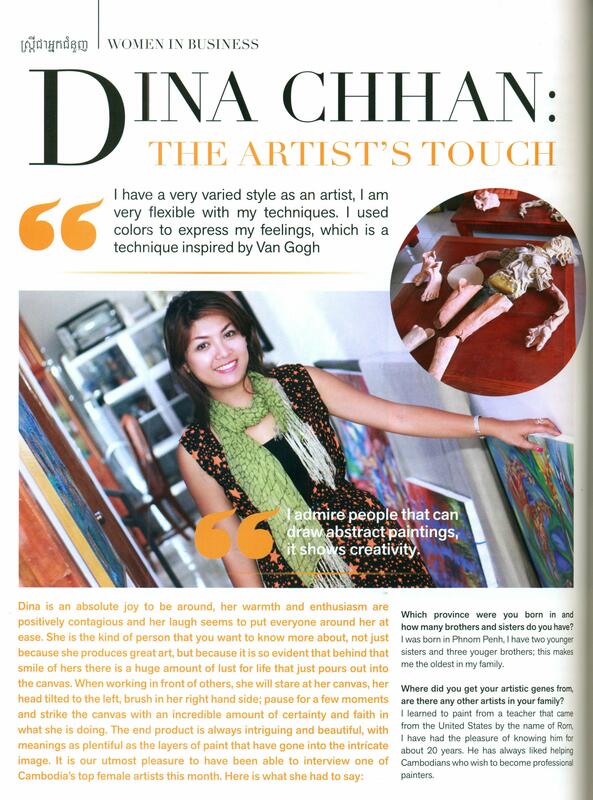 Dina works in a range of media including painting and sculpture. Themes of life, music and everyday activities have captured Dina’s imagination over the past ten years. Smiling families, energetic musicians, a contemplative monk, the labours of the rice field and the market. Through a range of styles Dina explores the daily life of Cambodians.